A recent release on the Wergo label saw American pianist Ursula Oppens performing the solo piano music of Elliott Carter. This has now been followed by another release featuring the same pianist, this time playing the complete piano works of fellow American, composer Tobias Picker. Picker, a prolific New York based composer, is recognized as an important American writer of contemporary opera. He may also be known to some here through his appearance on the BBC programme Horizon, which focussed on how his having Tourette's syndrome interacts with his work both as an artist and a performer. The works here range over the course of twenty years, beginning in the late seventies. The disc opens with Four Etudes for Ursula. The pianist is immediately given scope to show off her not inconsiderable talent, articulating the opening movements' racing lines with a lightness of touch that lets the listener's ear adjust to their coursing speed without any difficulty. The style of the music is located somewhere in the grey space between tonality and atonality, with tonally derived gestures expressed in atonal swaddling. It shouldn't be too hard to swallow for those with an interest in the concert music of today, and has a sophistication of craft and reference if somewhat lacking in innovation. Old and Lost Rivers is the most frequently performed of Picker's works, and this piano transcription dates from the same time as its first-performed version for orchestra. The feeling of nostalgia and hope that the composer associates with the work's inspiration is invoked well by the slow, pentatonic-esque drift that pushes its current along its course in an unhurried way, the piece in this arrangement reminding me somewhat of Ligeti's ‘White on White' Etude. A barrage of notes breaks this lull and opens the Three Pieces for Piano with a bang, the attendant moment of exhilaration beginning to subside just as the piece ends. This leads into the long slow movement of the work, which is like an atonal counterpart to Old and Lost Rivers, a twisting of its memory into new contours. Tonality is alive in the memory of this piece as well, in the contours of the phrasing and the dynamic drive they generate. The work's arch form is completed by its short outburst of a last movement. The neo-Romantic engine lying beneath much of this music is most explicitly laid out in Where the Rivers Go, a work unashamedly emotional in tone, although avoiding being mawkish. It is played beautifully by Oppens, who understands well this music and what it demands of a good performer. This piece provided the basis for the opening scene of Picker's opera Emmeline, and one can see how it is well suited to the draping of an atmosphere around a setting of place and action; it appears to speak and tell a story of its own, swirling around the key of B-flat minor. Oppens and Picker first met in New York in 1973, and the first work the pianist commissioned for the composer was …when soft voices die…. Its title is taken from a poem by Shelley, with a concern appearing here again of memory and the trace and impression of the absent other that lives on in our mind, and which has a life of its own. The mood of the work is somewhere between Schoenbergian expressionistic and neo-Romantic, swift changes of mood creating a sort of frenetic energy and listlessness in the ever-searching music. Oppens keeps up the pace admirably and injects continuing vitality into the nervy discourse. The Blue Hula is defiantly lighter in tone, although still with occasional atonal awriness to throw the listener off; and it comes as a relief after the lengthy preceding work. 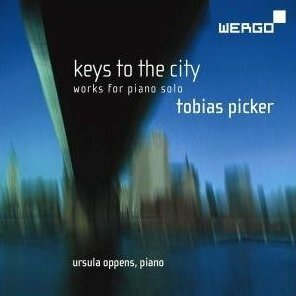 The disc closes with Picker joining Oppens on the second piano of Keys to the City, the title work of the disc and also its longest one. In his name-dropping sleeve note, Picker describes how this work was commissioned to accompany the centennial celebrations for the Brooklyn Bridge, first performed as a piano concerto to an audience of two million people. It is a sort of twelve-tone concerto, rendering the atmosphere of New York in an updated fashion from that other Brooklyn denizen, Gershwin, whom it someway homages. The intricate grids of tone rows, drifting out in all directions, mirror the colossal construct of the bridge, with all the moods of day and night of which the bridge is silent witness seeking feature in the musical evocation. The different parties involved in this release seem proud of their results – and justly so, with Picker and Oppens both handsomely represented by it. For listeners interested in contemporary piano music, without any agonised theoretical musings to back up the noise of finger, ivory, hammer and string, this caters to that more traditional taste, and may be a release to seek out.